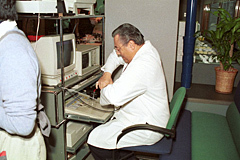 The Roth Study Club Japan (RSCJ) was established in 1996 at the suggestion of Drs. 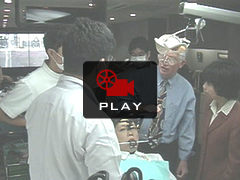 Roth and Ikeda, as a forum for mutual learning for graduates of our 2-year comprehensive orthodontic course who continue to practice the Roth Philosophy. Completion of the course does not automatically qualify the graduates as RSCJ members. To join the study club, they must submit required cases to be reviewed and certified. Our purpose is not to socialize, but to bring together the knowledge and experience of those who practice the philosophy at a high standard. Discussions held by the members are thus practical in nature rather than theoretical. how to check the bite. This is a two-year comprehensive course in orthodontics, comprising a series of seven 5-day sessions held every 4 months over a period of 2 years. 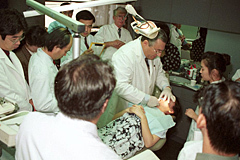 The course is designed for orthodontists and encompasses almost all areas of dentistry including diagnosis centering on occlusion, treatment planning, establishment of stable mandibular position, treatment mechanics, late mixed dentition treatment, orthognathic surgery, periodontal considerations in orthodontic treatment and relevant prosthetic procedures. is repairing (?) one during the course. Unlike conventional orthodontic diagnosis, particular emphasis is placed on the use of an articulator, achievement of stable mandibular position with a stabilization splint and diagnosis of condylar position in the fossa for diagnosis of functional occlusal status and establishment of treatment goals. The course offers lots of hands-on experience. The participants are also given many homework assignments. Every participant is required to present a case. Overall, they find the course very challenging. Dr. Ikeda, RSCJ President, is running the course with the wishes of the late Dr. Roth. We had a pleasure of having Dr. Roth attend every RSCJ meeting and critique each case while he was still with us. There were an increasing number of in-depth case presentations as the years went by. We were very proud that some of the cases were complex but well-managed and commended by Dr. Roth. Dr. Roth tossed in the air at the graduation party of the 2-year course.